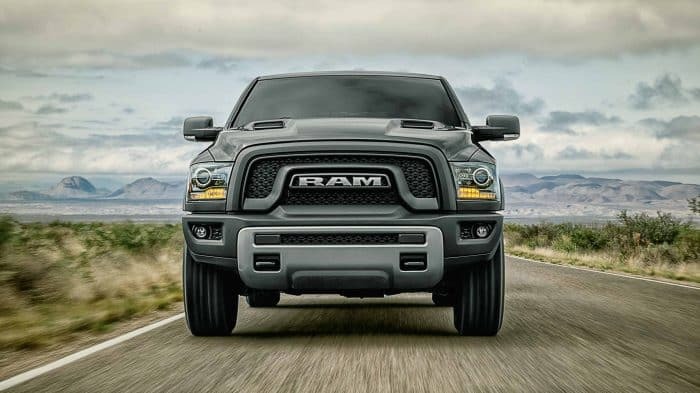 The RAM 1500 is America's longest lasting pickup. The Rebel trim is getting a ton of new features. The add-on features are a Uconnect 8.4 and media hub, anti-spin differential, automatic dual-zone temperature control, remote start, rear back up camera, rear park assist, security alarm, and a premium gauge cluster. Of course, the other trims get some new upgrades. All the trims will have a new five-micron cabin air filter. Even though there are new features for most of the trims, a lot of the returning features make the RAM 1500 great. Keep reading to learn about all the features in the 2017 RAM 1500. The RAM gets three engine options. The standard engine is 3.6-liter Pentastar V6 that is powered by 269 pound-feet of torque and 305 horsepower. The 5.7-liter HEMI V8 is rated at 410 pound-feet of torque and 395 horsepower. The turbocharged 3.0-liter EcoDiesel V6 is rated at 420 pound-feet of torque and 240 horsepower. All the engine options come with an eight-speed automatic transmission. It also gets a rotary knob instead of the traditional shift level. The standard drivetrain for the RAM is a rear-wheel drive and two four-wheel drive systems. The two 4WD systems have a two-speed transfer case with low-range gearing. One system is a traditional 4WD and the other is an auto 4WD that can automatically switch between rear-wheel drive and four-wheel drive. The towing capability is great when the RAM truck is properly equipped. The gas V6 can tow up to 7,610 pounds, the diesel V6 can tow up to 9,210 pounds, and the V8 can tow up to 10,640 pounds. There are many configurations of the RAM 1500. There are three cab styles: the regular cab, the quad cab, and the crew cab. The regular cab has the option of a short and long bed, and the sizes are 6-foot-4-inch or an 8-foot cargo bed. The quad cab comes with a long bed at the size of 6-foot-4 bed. The crew cab has a long and short bed, with the sizes are 5-foot-7 or 6-foot-4 bed. Along with those options there are ten trim models: Tradesman, Express, HFE, SLT, Big Horn/Lone Star, Sport, Rebel, Laramie, Laramie Longhorn and Limited. The base features are a seven-pin wiring harness, automatic headlights, a locking tailgate, a rear backlight, a 40/20/40-split front bench seat, vinyl upholstery, and a six-speaker sound system. The trims are just blueprints because a lot of the items are optional and interchangeable. There are many add-on features like the Tonneau cover, weatherproof bedside bins, and appearance enhancements like chrome bed rails, a sunroof, heated rear seats, and a rear defroster. The tonneau cover controls air movement over the truck's body to improve airflow and helps with aerodynamic drag. Do you have any other RAM trucks available? What are all the exterior color options? There so many color options and even the ability to use two-tone colors. The options are Red Pearl, Flame Red, Luxury Brown, Black Forest Green, Blue Streak, True Blue, Bright Silver Metallic, Granite Crystal Metallic, Maximum Steel Metallic, Brilliant Black, Pearl White, and Bright White. The 1500 has many standard safety features including four-wheel anti-lock disc brakes, hill start assist, trailer-sway control, full-length side curtain airbags, front-seat side airbags, and stability control. There are also available features like a rearview camera, front and rear parking sensors, and the Uconnect Access that adds an emergency telematic system. Come down to Greenbrier Dodge Chrysler Jeep RAM to check out the 2017 RAM 1500.